Although many divorced couples would prefer not to interact with one another, this is largely impossible for the parents of minor children. No matter how well divorced parents cooperate, disagreements are bound to occur. At some point, disputes regarding birthdays, vacation plans, school work, and other aspects of a child’s life will inevitably arise. In order to avoid not only fighting in front of the children but also angry telephone calls and emotional exchanges, many former couples have turned to technology for assistance. Increasingly, parents are using email, online calendars, and text messages to communicate. According to the Chair of the American Bar Association’s Family Law Section, Randy Kessler, some former couples even utilize divorce apps downloaded to a smartphone. For some parents, the detachment level associated with technology reportedly removes some of the emotional aggravation of coordinating with a child’s other parent. Some custody arrangements now require regular Skype sessions when a parent cannot be there in person. In addition, many divorced parents are ordered to purchase a cellular telephone for their child in an effort to provide access to both parents and eliminate the possibility of a heated intermediary exchange between a child’s parents. In many cases, a child’s mobile phone must be available during specified hours. Such a plan is useful where warring ex-spouses are forbidden by a court from speaking absent an emergency. Because joint child custody has become increasingly common in California and throughout the nation, online calendars can be particularly useful as parents struggle to coordinate with one another regarding their children’s lives. Recently, some judges began ordering former spouses to coordinate child custody matters through online tools designed to eliminate friction. The tools allow family law attorneys, mediators, and judges to review and supervise email exchanges between parents. All emails are time and date-stamped, and parents have the opportunity to create a shared expense log as well as automated reminders for important events and obligations. The type of written evidence logs created by such online divorce tools may also provide parents with an additional incentive to watch what they choose to say to one another. Often, the most contentious aspect of a divorce case involves child custody and visitation. After parents engage in mandatory mediation, a California judge will determine both the legal and physical custody of a former couple’s children using a parenting plan. Legal custody normally involves decision-making about a child’s health care, education, and general welfare. Physical custody describes a child’s visitation schedule. Although one parent may receive primary physical custody, it is normally jointly held by both of a child’s parents. If you are a divorcing parent who has child custody concerns, you should discuss your situation with a skilled family law lawyer. If you have questions about the child custody or overall divorce process, please give Doppelt and Forney, APLC a call toll-free at (800) ROY IS IT (769-4748). Mr. Doppelt is a knowledgeable San Diego child custody attorney who has more than 20 years of experience guiding parents through the sometimes distressing child custody process in California. 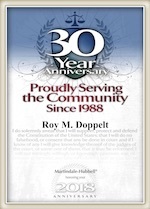 Mr. Doppelt is available to help clients with all of their child custody, child support, divorce, spousal support, adoption, paternity, and other family law needs. Doppelt and Forney, APLC represents clients located in San Diego, Encinitas, Linda Vista, Scripps Ranch, and throughout Southern California. To schedule a free confidential consultation with a hardworking and committed family lawyer, feel free to contact Doppelt and Forney, APLC through the law firm’s website.